• three sets of differentiated, no prep, printable practice pages for numbers 1-20 that use spring clip art and are common core aligned (color and black and white). Students can practice the standards at a level suitable to their ability. 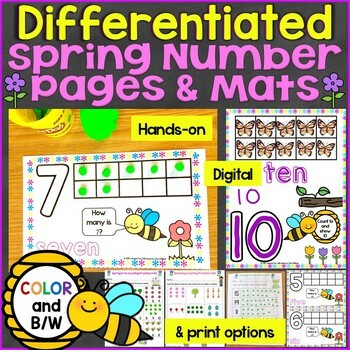 The play dough / center number mats have a fun spring theme to spark student interest and come in color and black and white (the black and white can be printed onto colored paper) as well as both full page and half page sizes. Students can roll play dough into small balls (great fine motor practice) and place the appropriate number of balls in the ten frame. They can also form the play dough in the shape of the number inside the large “bubble numbers”. These mats may also be used for centers. Students can place counters, bingo chips, spring erasers, pom poms, or other manipulatives in the ten frames to represent the number. 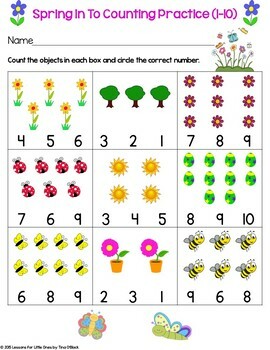 They may also use spring stickers, bingo dabbers, color the squares with spring colors, or draw their own pictures. The large “bubble numbers” can be traced or rainbow traced (traced with as many colors as possible) and then students can practice writing their own numbers in the white space. The first set of practice pages (2 color pages, 2 b/w pages) requires students to count sets of objects and circle the correct number from 3 given numbers to practice counting, number recognition and core standards K.CC.B.4 and K.CC.B.5. and core standards K.CC.A.3, K.CC.B.4 and K.CC.B.5. These pages are perfect for morning work, extra practice, assessment, or regular class work. • How to use the practice pages in both Pic Collage and Seesaw - save paper and spark student interest by making them digital! "Perfect assessment for my Kindergarten students!" - Sarah K.
"Nice sheets!" - Linda H.
"This is perfect!!!" - Vickie S.
"Great materials!" - Mary W.
"Great for preschool and TK!" - Emily O.